Finance is the federation of finance federations and is a link between the federation and its members. Finance is edited journalistically and is built up of journalistic articles, political comments and information from the Finance Federation. The contents of this magazine deal with occupational issues, job and career development and news in the financial sector. Finance thus gives readers inspiration for job-related and personal development as well as tools for their working day. It is a crucial goal that readers should experience Finance as living, current, relevant, readable and useful. Finance reader is spread over 15% managers / managers, 45% assistants or specialists and 40% bank and office assistants, IT staff and other staff groups. The readers are therefore active participants in the purchase of furniture / fixtures and IT to the financial sector, information on investment and finance, financial subcontractors and security systems. Finance is published 11 times a year, with a record of 51,162 copies Denmark’s largest magazine in the financial sector. Finance emerges as an elegant and modern designed professional magazine. 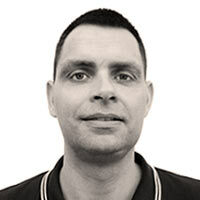 Finansforbundet has the website Finansforbundet.dk with significant news in the financial sector and the job bank Finansjob, where vacancies in the financial sector are announced. 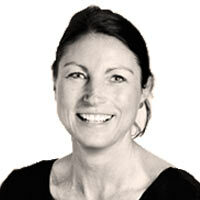 Finance jobs are part of the Profiljob.dk network. 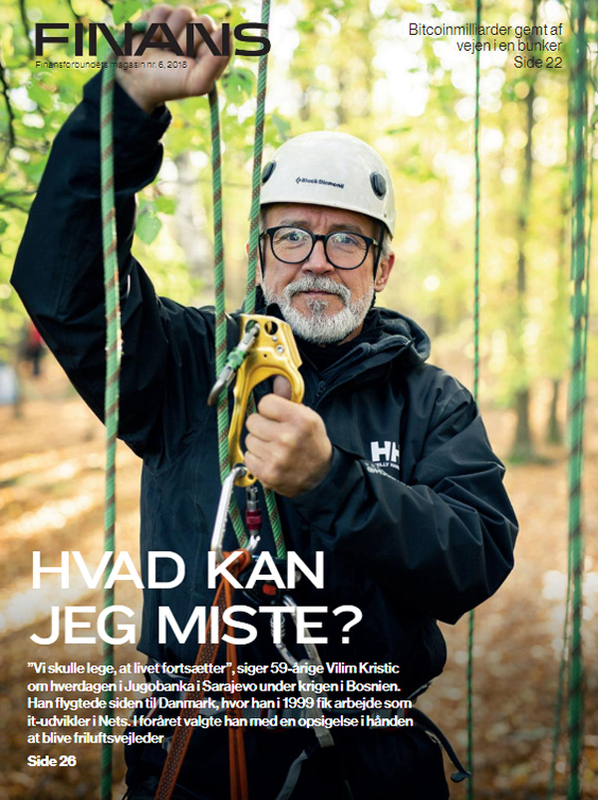 Finans is a member of Danish Media, and the magazine’s stock is controlled by the Danish Media Warehouse Control. In order to provide solid information about our readers, Finans is also measured in Index Denmark / Gallup. For advertising and media agencies 3% material refund is granted for delivery of finished material. In addition, 2% information and collateral is granted to media agencies that are eligible for compensation, cf. Creativity & Communication’s list. Advertising material for print will be delivered as print PDF (min. 300 dpi, CMYK). The material can be sent to DG Media at epost@dgmedia.dk (maks. 20 MB) eller ftp-server. “Medlemsnyt” is a digital newsletter that is published once a month to all members of the Finance Association. At present, the newsletter is segmented to IT members and managers. From 14/12, there are also segmented for approx. 1000 students. Medlemsnyt’s overall purpose is to serve relevant content – politically and journalistically – that gives value to members, as well as to showcase the many member benefits of the association. This to help remind members of their membership and maintain them in the membership. The newsletter is a so-called push-media that generates greater activity on our other platforms – website and Facebook. Material for banner advertising must be delivered as JPG and must be at most 100 KB. For all types of banner ads, a URL must be provided. Logo for job link must be in the format B: 100 x H: 60 px and must be delivered as JPG. The material can be sent to DG Media at epost@dgmedia.dk (maks. 20 MB) or ftp-server. 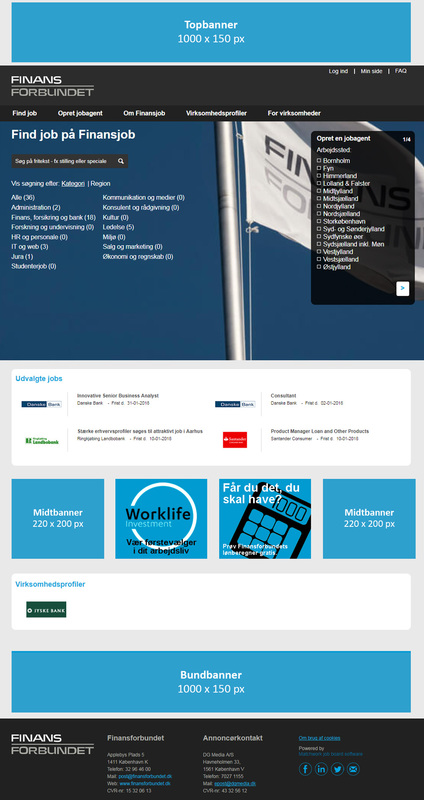 Finansjob.dk corresponds to Finans, Finansforbundets Magasin, and all job advertisements in Finance are therefore also included as job vacancies at Finansjob.dk. For job advertisements without print ads, the job posting must be sent as a Word file. Logo for job advertisement must be submitted as GIF or JPG in format H: 250 x B: 150 px. Banner advertising material must be delivered as GIF (for animation, max 10 sec and / or 3 loops) or JPG in max. 100 KB. All material shall be sent to DG Media at epost@dgmedia.dk (max. 20 MB) or ftp server.